The first thing to be understood about Will Todd's Alice's Adventures in Wonderland at Opera Holland Park is that it is completely mad. 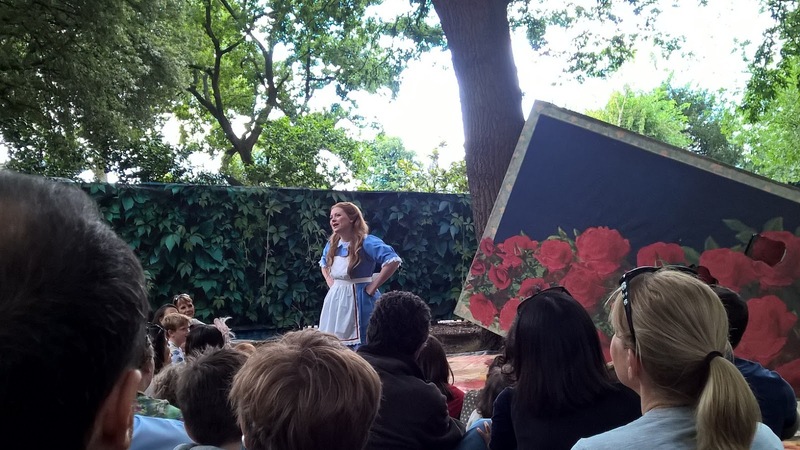 Some 16 singers and 12 instrumentalists perform a 75 minute opera out of doors on the Yucca Lawn at Holland Park in a production which uses four different locations thus requiring cast, musicians and audience to move four times whilst the music keeps going. There is no amplification, everything is acoustic and almost no spoken text, this is an opera. Oh, and a significant number of the audience are tiny children and we all have to sit on cushions on the ground. And it works. I returned to catch Alice's Adventures in Wonderland on Saturday 25 July 2015, during the opera's third run (it was premiered in 2013 and returned in 2014). Martin Duncan's production, in designs by Leslie Travers, is in rude health with a cast, many of whom have been in the production since it opened in 2013, which included Fflur Wyn as Alice, James Cleverton as Rabbit, Robert Burt as Dad and Red Queen, Victoria Simmonds as Mum and Mad Hatter, Magid El-Bushra as Cheshire Cat, Keel Watson as Caterpillar and John Lofthouse as March Hare and White Knight. Matthew Waldren conducted the instrumental ensemble. Will Todd, and librettist Maggie Gottlieb, have taken the familiar characters from Lewis Carroll and many of the well known situations and woven them into a narrative with a far stronger sense of purpose than the novels. The young audience seemed enchanted by seeing the familiar characters and were not in the slightest bit phased by the new narrative setting. By reworking the plot Will Todd and Maggie Gottlieb have created a lively and very viable family opera. Intended as an introduction to opera for children and parent alike, it is an afternoon of great fun. But there is a sophistication to it too. Whilst Will Todd's score was designed to be played out of doors, is highly coloured and practical (an accordion for mobility), if you listen to it on the recent CD from Opera Holland Park (see my review) there is a lot of enjoyable detail. This is a work which repays attention but which works well in its intended location outdoors. Having recently heard another opera designed for a family audience, Richard Ayres and Lavinia Greenlaw's Peter Pan in WNO's production at Covent Garden, I have come to the conclusion that form follows function in such works. The function of Peter Pan was unclear, was it children's work or an adult one, whereas Alice's Adventures in Wonderland had a clear function; it was to be played on the Yucca Lawn to a family audience and music grab them. As a result the form reflects this, the work zips along and whilst there are big tunes which grab you, Will Todd does not let them settle and keeps the whole flowing. And it certainly fulfilled its function when I saw it on a cloudy Saturday afternoon. The previous day had been so wet that the performance had to be moved under cover, so we sat on cushions on the damp ground. It did not bother the audience, who paid attention, moved when told and generally enjoyed themselves. It was fascinating to watch how closely the audience followed the action, and how strongly involved they became. And after the show was finished, there were huddles of young audience and parents gathered around the performers. Hearing the work live for a second time, I became struck by the wit of the libretto. It has a directness and liveliness which appealed to the children, but with sophisticated detail which was clearly aimed at the parents such as the use of 'dialectic', 'opposable thumbs', and jokes about SATS. Fllur Wyn made a bright and highly believable Alice, with a light lyric voice, but with the requisite power in the big moments. And with bags of charm which enchanted the children. James Cleverton was a suitably suave White Rabbit, Magid El-Bushra nicely slinky as the slitheringly chromatic Cheshire Cat and Keel Watson that spaced-out blues singing Caterpillar. Victoria Simmonds combined hard pressed Mum with a demented Mad Hatter. John Lofthouse was the game-keeper like March Hare and a totally charming White Knight (complete with Lesley the Horse). Joanna Marie Skillett was the Dormouse. The remaining cast included Samantha Price and Daisy Brown as a remarkable alike pair of twins, Tweedles Dum and Dee, Kathryn Walker as Humpty Dumpty, Maud Millar as the Bottle and Duchess, and Rebecca Hardwick, Rosie Middleton, Edward Hughes, Benjamin Newhouse Smith, Henry Grant Kerswell as Victorians. There is, of course, one more character. Robert Burt was a hilariously scary Queen of Hearts, giving a strongly etched performance and he looked fantastic too. Matthew Waldren was unflappably in charge of the instrumental ensemble who have to move along with the rest of the opera. The opera runs until 1 August 2015 at Holland Park, but there is a chance to hear it again at the Linbury Theatre in Covent Garden in November. And, of course, there is the CD (see my review) and Will Todd was present on 25 July 2015 and was signing discs for eager young audience members after the performance.